I’ve written before about the frustration that comes from accidentally closing a Safari window with multiple tabs open, losing those tabs. Taboo pops up a warning when you try to close a window with multiple tabs, or try to quit Safari with such a window open. ForgetMeNot is even more practical; if you quit Safari with multiple tabs open, the next time you relaunch Safari, those windows and tabs are all restored. But what if you’re using Camino ? Camino users have long had the multiple-tab warning—it’s built into the browser—but I’ve received a good number of requests for a way to get, for Camino, tab-saving goodness like that provided by ForgetMeNot. The answer is Ben Willmore’s CaminoSession 0.86 ( ; payment requested). (Thanks to TUAW for the tip.) After installing CaminoSession—I like that you can choose to install it for all user accounts or just your own; I took Taboo and ForgetMeNot to task for not offering this option—and relaunching Camino, it will automatically restore all tabs and windows that were open the last time you quit Camino. 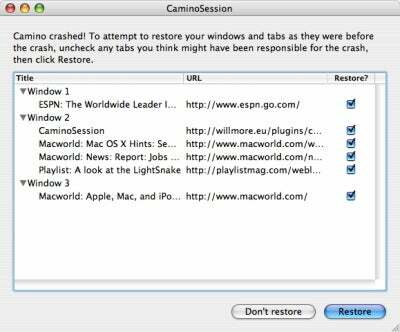 Even better, CaminoSession also protects you from Camino crashes . If Camino crashes or quits unexpectedly, the next time you launch the browser you’ll get a handy dialog listing all the windows and tabs that were open at the time of the crash; you can choose which windows and tabs you want to restore. If you think a particular Web site was actually responsible for the crash, you can choose not to restore that tab or window. You can also manually save or restore a set of windows and tabs by choosing Save session or Restore session , respectively, from Camino’s Go menu. You control CaminoSession’s features using a new CaminoSession pane in Camino’s Preferences window. You can disable auto-save when quitting, auto-restore when launching normally, and/or auto-restore when relaunching after a crash. Sure, you could get similar features by switching to another browser, but if you prefer Camino, CaminoSession is a must-have.